Within India, 40 lakh persons would represent various fractions of the populations in 21 states, but more than the population of Goa, any Northeast state other than Assam, or any Union Territory other than Delhi. How much is 40,07,707, the number of applicants left out of Assam’s draft National Register of Citizens (NRC) published Monday? For context, the number is nearly as large as the population of Croatia (41 lakh in 2017), 5 times that of Bhutan (8 lakh) and 11 times that of Iceland (3.4 lakh). 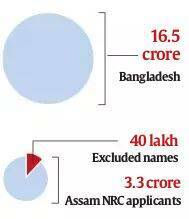 In Assam itself, the 40 lakh omitted names represented 1 in every 8 NRC applicants, who numbered 3,29,91,384. These applicants are, in turn, equivalent to about one-fifth of the population of Bangladesh in 2017. 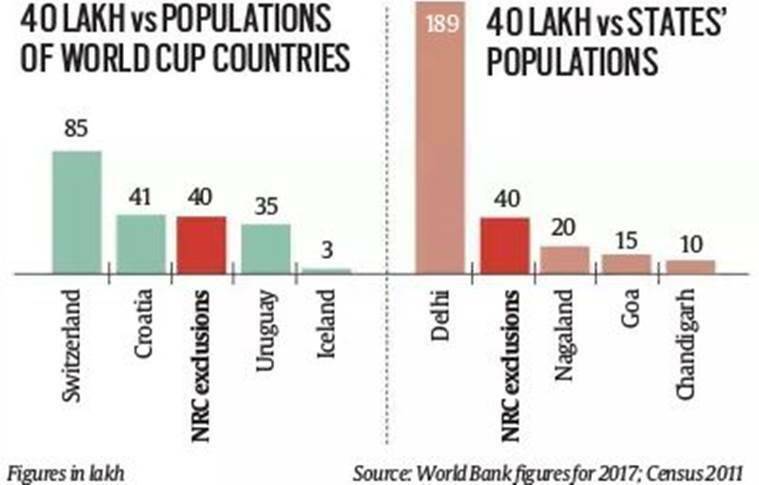 Besides Croatia and Iceland, how does 40 lakh compare with the populations of other countries that played in the recent World Cup? While it is a fraction of larger countries such as Brazil or Russia, the number is almost half the population of Switzerland, more than one-third that of either Portugal or Belgium, and more than the entire population of Uruguay. In Idukki, where the maximum storage level is 2,403 ft, the orange alert was issued after it reached 2,395 ft.
On Monday, the Kerala government issued an “orange alert” in three districts as the water in Idukki reservoir came close to full storage level, and said it would issue a “red alert” if it reached a certain level. “Orange” and “red”, along with “yellow alert”, are part of a colour-coded warning system the Central Water Commission uses to alert local populations of the severity of a flood situation. Each of the over 700 flood forecasting stations in the country has a defined “warning level”, “danger level” and “highest flood level” for the river on which the station is based. While the warning and danger levels are fixed for a river, the highest flood level is adjusted every year ahead of the start of the flood season on the basis of levels reached the previous year. A yellow alert is issued when the river is “above normal flood” level, or between the warning and danger levels. An orange alert is issued when the river is in “severe flood”, or the level is between the danger and highest flood levels. In Idukki, where the maximum storage level is 2,403 ft, the orange alert was issued after it reached 2,395 ft. A red alert is issued when the waters breach the highest flood level. In Idukki, officials said they would issue a red alert if the water reaches 2,399 ft.